To act or fail to act in such a way as to bring about the possibility of an unpleasant or unwelcome event. This is the definition that nails it for me. After working with lawyers for the last dozen months, rather intensely I might add, I found myself continuously being told I was putting myself at risk. “If you help the entrepreneurs with their offering documents, you may put yourself at risk!” I’d scratch my head and ask, “Well, then who will help them?” What do we risk if I don’t? At the risk of doing something, there is the possibility of something unpleasant resulting. Yes. That’s true, but more often than not, unpleasant things happen when we don’t act – when we don’t do something. I swim in risk-infested waters, full of risk-grabbers, risk-ignorers, risk-takers. I love these people. I admire the determined, the intrepid, the do-ers. These entrepreneurs who have stepped up, grabbed hold of something, and will be damned if they will let go. They have a dream, an idea, and are completely committed to it. At Hatch we work with entrepreneurs of the best kind, those who are taking on our social and environmental challenges, for us. Sometimes they will benefit, maybe sometime out in the future, with luck, or not. Sometimes they are inventing ingenious things like electric farm vehicles or farms in a box. But overall, they have put themselves out there. Who are these people and why are they so committed? What prompts John MacDougall to seek to build thebest wooden bat in the world or Eli Eichenauer to want to transform health care? I don’t know. It may be the same thing that prompts me to schlep all over the state speaking to Oregonians about the new law that invites them to support these risk takers – to share the risk with others – by investing in the enterprises launched by these risk-embracing entrepreneurs. Hatch Innovation wasn’t paid to drive this initiative. No grants set us to work on this; no individual donations provided support. We spotted an opportunity, and decided to take it on. The law was written to minimize risk to the investor to the degree possible, even choosing to have (practically) the lowest investment cap in the country (out of nearly 20 states). I am inspired by this commitment to both the investor and the entrepreneur. I am tickled by it. I am moved by its invitation to ordinary people to participate in a very real way in the nurturing of risk-takers, without which we would not have – well – uh – practically anything, from light bulbs to microfinancing to rocket ships. Without entrepreneurs poking around in the world, sticking their noses where they often don’t belong, asking naughty questions of the status quo and suggesting alternatives, we have no chance of a solution to – well – to anything. 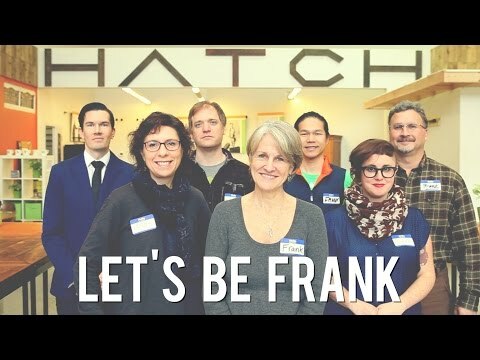 On HatchOregon.com, you can invest in these entrepreneurs, (at your own risk… of course.) You can make things happen. You can’t know whether the risk is low or high, really. You can’t predict what might happen. You have to suss it out on your own, checking your pulse and pocketbook. But hell, isn’t there a risk if we don’t act? I’m just being completely, perfectly frank with you (scroll down for the video) but the fact that you can, is what matters. Not whether you should – that’s a personal decision. I’m simply intrigued with the fact that after 80 years we finally get to be risk-takers too.